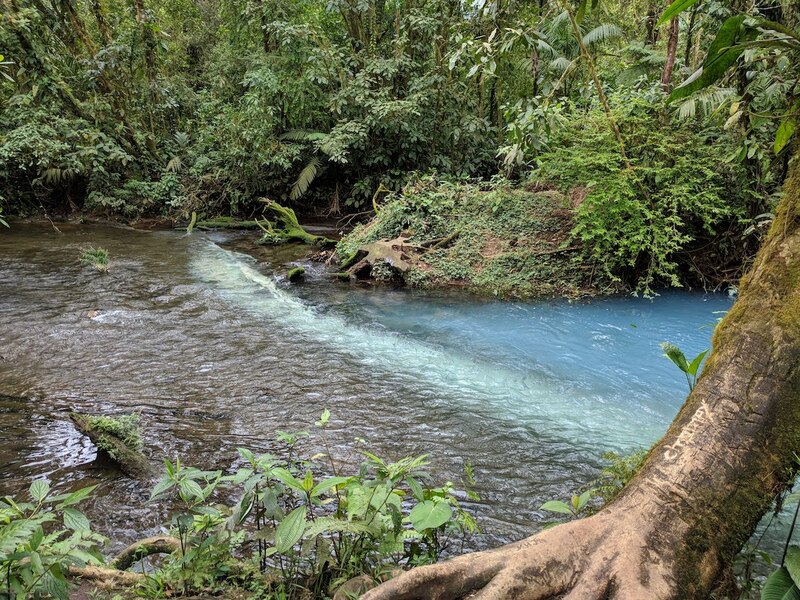 While researching about Costa Rica, we learnt about the blue water of Rio Celeste and decided to visit it on our way from La Fortuna to Monteverde. The last few miles drive to Rio Celeste is via a gravel road. Our rental car for the trip, a 2WD Toyota Yaris worked perfectly fine on this road. 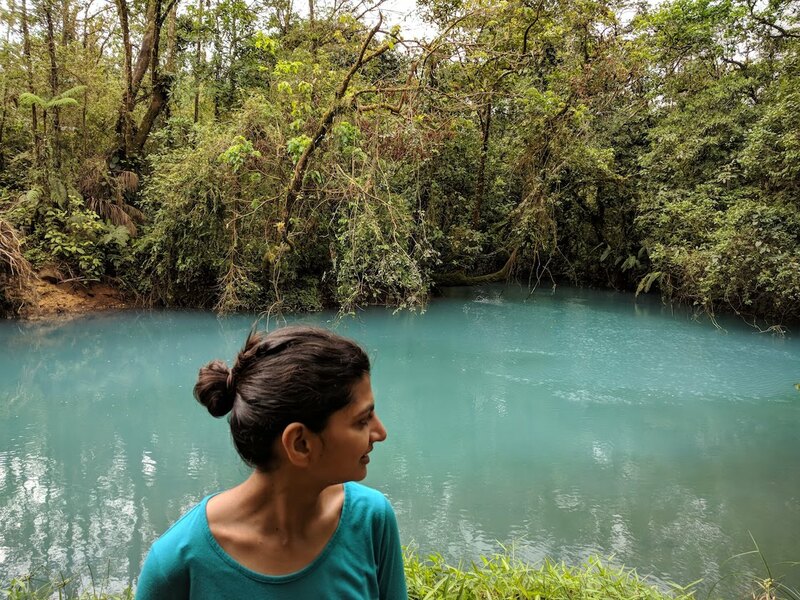 Unfortunately, we went to Rio Celeste on a day when the waterfall trail was closed for maintenance. Although we were disappointed, we decided to check out the regular trail in the park and started our hike. The rainforest was green and the trail was well-maintained to begin with. 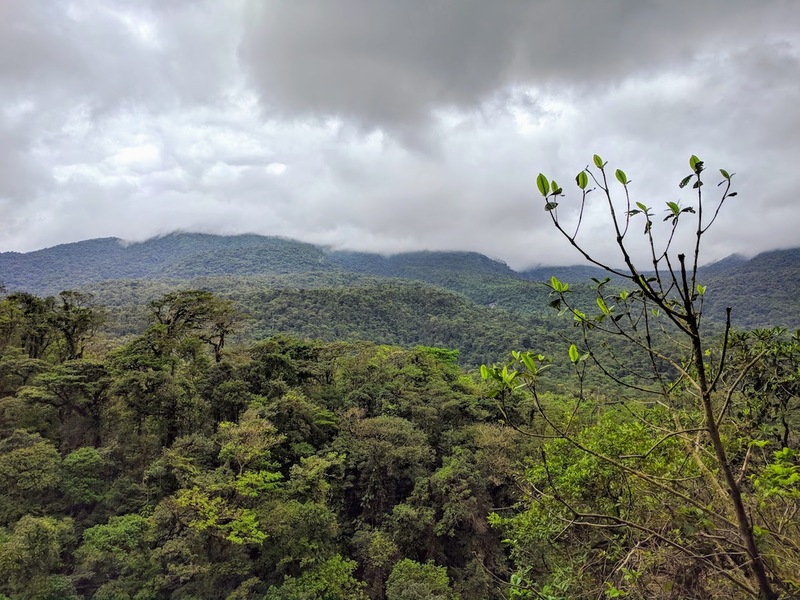 Soon, we reached a viewpoint with panoramic views of the rainforest. It was green and picturesque, and the scale of the forest was much bigger than what I'd imagined. Feeling a little tiny and insignificant we continued along and soon enough, got our first sight of the blue water at Rio Celeste. Here's the thing, no matter how prepared you are, nature will still surprise you. The blue water was a sharp contrast to the greenery surrounding it, and it was a very attractive sight. Entry into the water is not allowed, so after appreciating the view for some time, we continued the hike. As we walked on the path next to the blue river, we smelled a tinge of sulphur and after looking around, identified the source. There were a couple of small boiling pools in the midst of the river because of the volcanic activity underneath. It was very unique and seemed like a gentle reminder of the fragile earth underneath us. It was something I didn't expect to see, so I loved it! The next thing we encountered on the trail were spider monkeys. Extremely hyperactive, these monkeys were constantly jumping on the top most branches of the trees next to the trail. These monkeys have a brown body and black limbs and have the ability to use their tail as a extra limb. They gorge on fruits, seeds and flowers, so they're filled with sugar and have the energy to keep wandering around endlessly. It was exhilarating to watch them. They moved faster than my brain could comprehend and my eyes could see. We then passed a small bridge across the blue river and came close to the end of the trail. At the end of the trail, the blue river meets the normal river. You can clearly see where one river ends and the other begins, and this was one of the best sights of this trail. The work of nature is more delightful than what we can expect. This seemed like a popular lunch spot, because we saw a lot of raccoons here, unafraid of humans and looking for food. It seemed like they were used to people feeding them at this spot. We shushed them away, and I want to call out that it is never a good idea to feed wild animals, because it makes them dependent on humans for food (and thus survival) and prevents them from staying wild. After relaxing for a bit we walked back through the same trail and reached the park entrance. The entire trail we walked was about 5 kilometers, so it's an easy hike. The rocks on this trail can be a little slippery, especially if it rains, so make sure to watch your steps. We had lunch at a restaurant located near the park entrance and the food was fresh and delicious. I don't remember the name of the place, but there's only one restaurant here, so you can't miss it. We drank fresh coconut water from one of the road vendors, which felt cool and refreshing after the hike. 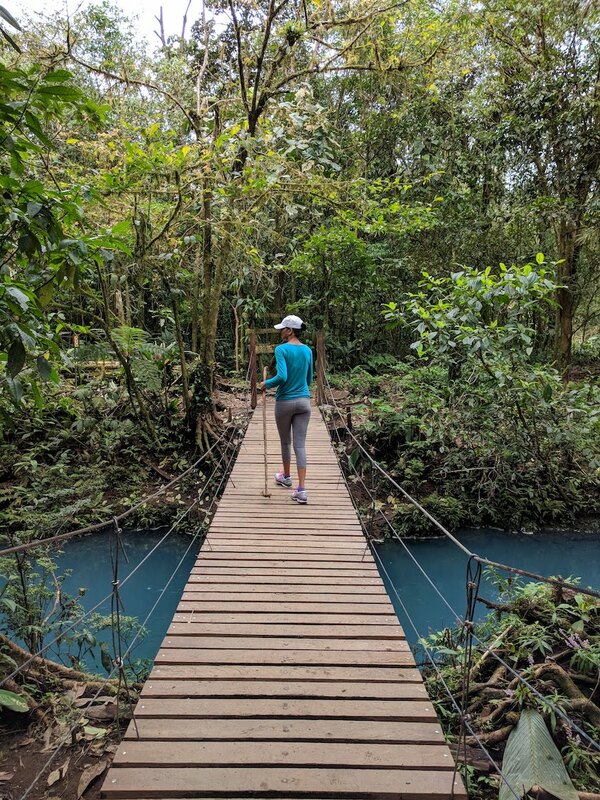 Despite not seeing the waterfall, we enjoyed this unique trail at Rio Celeste and loved the blue water. If you're around this area, it makes for an excellent day trip. What was your best day trip in Costa Rica? What was the most unique thing you saw there?